Another discovery from Further Confusion — and we wonder how we missed this before. 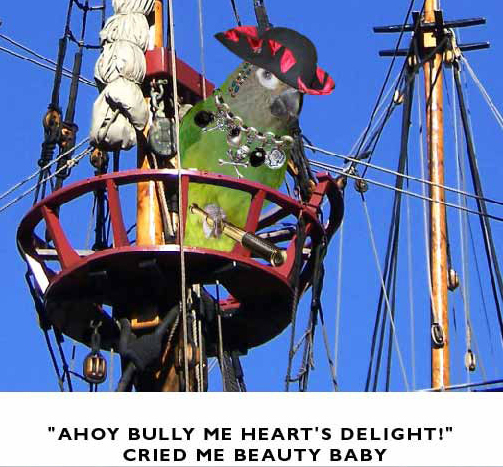 Black Beak the Parrot Pirate is a creation of Jennifer Sopranzi, Catherine Van Riper, and Tony Sopranzi, featuring CGI tricked-up photos of real animals as illustrations for their rousing sea adventure stories for young readers. “In the crystal blue waters of the Southern Seas lies the home of the fierce pirate parrot Captain Black Beak. Welcome to Conure Cove, the beautiful Island home of the brave and gentle beasts and birds who live in this mystic land. 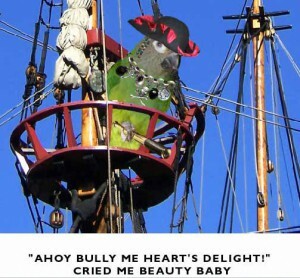 These are the first seven tales of Captain Black Beak, the greatest pirate parrot to sail the seas. Long may his tales be told in stories, songs and poems.” Now the first seven short books in the series (all of them available on Amazon) have been collected into a single volume, Black Beak: Pirate Saga, which also includes some new material. You can find out more about all of this at the home page of Black Beak Press. Pi-Rats (and Others) in the Sky!